Chance is that your Internet Service Provider has implemented a system that will display a custom page whenever you mistype a web address. The technique behind those interceptions is simple: most devices connected to the Internet use DNS servers that the Internet Service Provider (ISP) operates, as this is an automated process when the connection is setup. These DNS servers turn the domain names or searches that you type into IP addresses. If the name does not exist, a look up cannot be performed. This results in a "not found" or "problem loading page" error in the web browser usually. Some ISPs decided to route all requests that return an error to a custom page that they maintain. This page displays the same error message usually, other elements such as a search form or related options, and advertisement. The reason for doing this is simple: revenue. ISPs earn money if these custom pages are opened, or if you use them to find what you are looking for. More often than not, these pages are not helpful at all. Here is why. Most of the time users know where they want to go if they mistype an url, say ghackss.net instead of ghacks.net. All that they would need to do to fix the error is by editing the url directly in the address bar. The page that the provider displays on the other hand uses a different url structure leaving the user without that option so that the whole address needs to be entered in the address bar again. It may be possible to edit the url of the new page as well, as it usually contains the entered domain name as a search term somewhere near the end. Users with Internet Service Providers that redirect DNS errors have a few choices. Some ISPs have a page where the behavior can be changed manually. A second alternative is to switch DNS servers, for instance to a service like Open DNS which is freely available and does not come with that behavior. Again, some ISPs offer DNS servers that do not take part in those redirects but it is also viable to switch to open DNS server providers that do not redirect DNS errors. Tip: You may want to run DNS benchmark tools to test the performance of select DNS providers to find the best performing one. Check out the following page for a list of free third-party DNS providers. The third option comes in the form of the No Redirect add-on for the Firefox web browser. The add-on is only suitable for advanced users as it requires basic knowledge of regular expression to configure new Internet Service Providers rules. It comes with a few pre-configured including Verizon, Rogers and Earthlink but if the ISP is not listed it is necessary to add the search page to the list of available ones. It would then redirect the page that would get opened by the ISP to the browser's own error page when a domain name is not found. This is not as difficult as it sounds though as it is possible to simply copy and edit the regular expression of the already included service providers and websites. 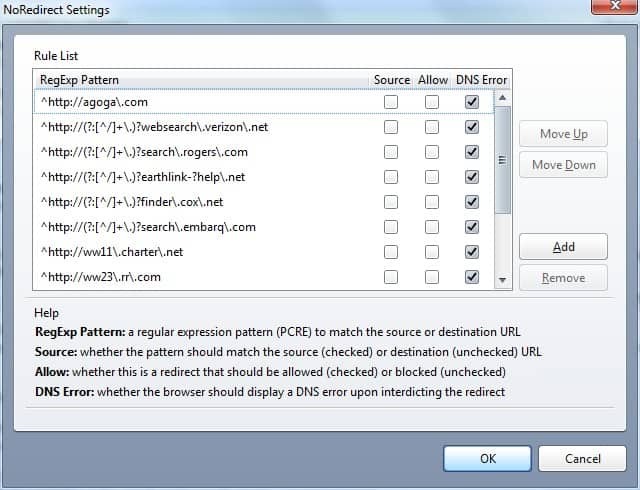 If the ISP is added properly, the browser's default "problem loading page" or "not found" page will be displayed instead of the redirected search page of the ISP. The main benefit of this is that it is now easy to edit the url that has been entered to visit the desired website. No Redirect not only takes care of Internet Service Provider redirects but also of so called smart error pages. Smart error pages are used by some websites instead of the usual 404 error pages when a page cannot be found. You might have seen those at Microsoft.com for example where Microsoft displays all kind of "did you mean" suggestions instead of an error message. The final option - one which I could not get to work - is the ability to always preview shortened urls. If anyone gets this working let us know in the comments. NoRedirect is an interesting add-on for users who are using the Firefox web browser and are experiencing DNS error redirects or smart error pages that they do not want to see. Find out how to prevent your Internet Service Provider from redirecting mistyped addresses to an error page of its own. I often use OpenDNS to avoid DNS Error. Thank you for this add-on. Or you can call/write them and ask them to disable it. That’s what I did. Hijack of DNS errors in order to gain money is a bad behaviour, but what about the in-text hijack for the same reason like the Kontera Advertising in this portal ? What’s the difference ? The main difference here is that this is my website and I can do whatever I want with it and you are free to stay away if you do not like it. ISPs on the other hand exploit something that is not theirs. Agreed. What a website does is its own business. Often when a website does something i dont like, I just add it to my hosts file. You cant escape your ISP so easy.